Should You Be Raking The Leaves of Autumn? In University City, like much of the country these past two weeks, we’ve been enveloped in extreme unremitting cold but just a month ago I was writing about leaves. My goal was to discuss leaf blowers. What follows is what I wrote before becoming distracted. Dendrophile that I am, my heart quickened when I witnessed the glorious display of colors that issued forth from their branches a month ago. I was so inspired I took the picture below from my front doorstep. Remember when there were leaves on the trees and snow wasn’t eternally covering the ground? Alas, I had forgotten that the vivid reds and yellows were a precursor to a constant deluge of dead and decaying dendrophitic detritus upon my lawn. Now the once beautiful leaves have become a nuisance-a funereal layer of death choking my lawn and once more I must grapple with how to handle them. The first time I was presented with this problem I pondered just leaving the leaves. After watching my neighbors dutifully raking and blowing their leaves into the street I concluded this was not acceptable. I purchased a rake or two and raked. Today I raked thousands of leaves into the street from which they will soon be sucked up by the leaf-sucking trucks of University City . Once more I pondered the wisdom of this approach. I wondered if I was somehow interfering in the cycle of nature on one hand and on another I considered buying a leaf blower. To treat leaves as trash is both environmentally foolish and financially ruinous. 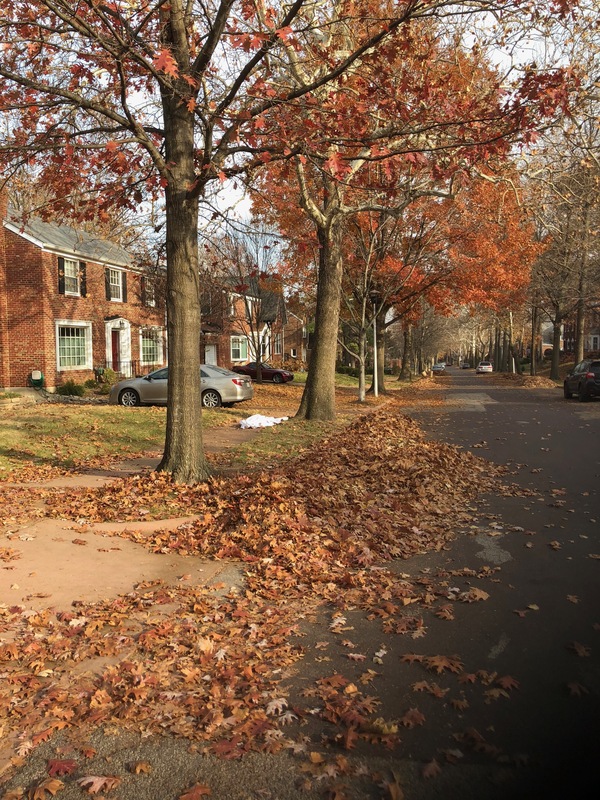 Currently, many municipalities encourage residents to rake leaves to the curb for collection, but before they are collected, heavy rains often wash the leaves into catch basins. There, they decompose and release phosphorus and nitrogen into streams and rivers that flow through the community. These excess nutrients contribute to algae blooms during the summer, which result in lower oxygen levels, making it difficult for fish and other aquatic species to survive. Municipalities, both large and small, spend thousands, even millions, of dollars each year to collect, transport, and process autumn leaves, tying up resources that could be used elsewhere in our communities. If we all keep our leaves on our properties, we will improve our gardens, save money, and enhance the environment we all share. After encountering this sobering statement which implies that the leaf removal operation is wreaking all manner of havoc I posted it on a discussion regarding the leaf removal schedule on Next Door . So, it seems it would be OK to blow or rakes leaves into the street. After much pondering, however, I decided to purchase a corded electric mower and perform the mulching myself. There is a cardiology connection to all this. As your cardiologist I advise embracing the raking as a useful combination of aerobic exercise and upper body strength training! Previous PostTop Skeptical Cardiology Stories of 2017Next PostDo You Need To Fast Before Your Cholesterol Test? I look forward to raking leaves, myself, each fall. I like the exercise and being outdoors in my favorite season. When there is a time that I can no longer manage the raking, it will be time to move to a condo or apartment. I hope to be raking leaves for many years to come! My ash trees provide the most amazing pinks, purples and maroons in early Autumn. They drop first. I usually wait until the last trees have let go their year’s investment before raking. By then the oaks and beeches are done and much their cast-off is wind-blown into out-of-the-way corners. I rake what’s left in places such as driveway and walkway onto my 10 foot square plastic tarp and haul them (Easily — the tarp is slick.) to useful places. Neatly tucked in at the feet of my various shrubs, the leaves protect from hard freezes and drying, eventually contributing valuable nutrients. My copper beech, left to grow naturally with shading skirts sweeping the ground, just loves the treatment. What’s left on the lawn I use my mulching mower on. Just as in Summer, all the fine cuttings are left in place for the benefit of subsequent growth. No artificial fertilizer necessary. When we lived in Bartlesville I used to drive a riding mower around the grass and blow the cut leaves into a pile. I then raked the shredded leaves and took them to the bottom of the yard where I had a compost heap. Over a period of time this gave me a very useful material for enriching the flower beds. We also have lots of mature trees around our home. We also use the mower and mulch as many as possible. It does come to a point when there are too many leaves to mulch with the mower. At that point we rake the leaves to the curb and have a landscape company come and mulch them and remove them.